For years, VLN has struggled with how to get our most useful clinic resources out to YOU, our clinics volunteers, no matter which clinic you staff. We’ve also wanted to incorporate YOUR knowledge and experiences at clinics. 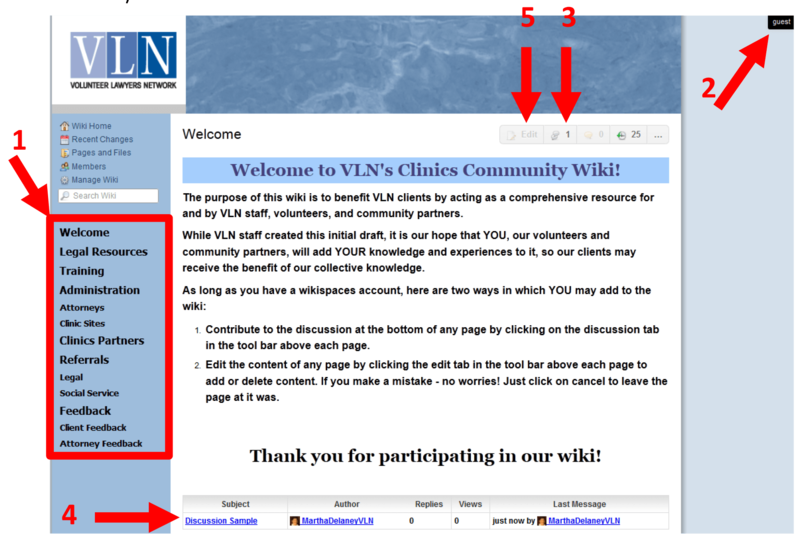 This month’s tip introduces our new VLN Community Clinics Wiki – which achieves both those ends. Please check it out at: http://vlncommunityclinics.wikispaces.com/Welcome. Need a help before or during a clinic shift? The menu on the left has answers to the most common questions. For example, “Legal Resources” brings you to pages organized by legal issue. “Training” loads our clinics trainings materials (both attorneys and assistants). “Clinics Partners” brings up information about our various collaborators in the community and the services they offer. Wish to comment on a resource or add a practice tip for your colleagues? Great! the first time you do this, you’ll need to join, which takes about 15 seconds! Hover your mouse over the “Guest” button (arrow 2), which will then bring up a “Join” option. Click “Join” and a pop-up screen will appear in which you may either sign in (if you already have a wiki account) or create a wiki account. Then click on the “Join” box. You’ve now joined the VLN Clinic wiki! To add your comment, click on the discussion item icon (arrow 3) and follow the prompts. Your comments will then be added to the very bottom of the page (arrow 4). To contribute to an existing discussion, click on the discussion item of interest (e.g., “Discussion Sample” at arrow 4). Editing pages. We would love for YOU to add new resources, create new pages of resources, or fix mistakes! To become an editor member of the wiki, please send your email address (the one you used to join the wiki) to [@encode@ email=”martha@volunteerlawyersnetwork.org” display=”martha@volunteerlawyersnetwork.org”] with “please add me to the wiki members.” Once you’re added, you can edit a page by clicking on the “edit” icon (arrow 5). Then you will be a co-author of the wiki and build your reputation in the VLN community. The success of the new Clinics Wiki depends on you. The more people who create, add to, and modify pages, the better it will be. When you see something wrong, fix it. When you learn something new, add it. Take a few moments to add YOUR knowledge on a page of the wiki. Future volunteers will thank you. Don’t worry if it’s in the right place. If we think it needs to be moved, we’ll do it. In the meantime, it will be easy enough to find by searching. The Clinics Wiki is like a digital brain that all volunteers share. Please help us make it smarter! December Tip of the Month – Interactive Resources!